Troy Guard and his kitchen at TAG have made a reputation with bold and assertive Pacific Rim cuisine and glistening raw seafood presentations. But the menu at his flagship restaurant also highlight’s Guard’s deft touch with Mediterranean flavors and ingredients — like this braised monkfish dish with a hodgepodge of ingredients that somehow come together to form a coherent impression. The plate begins with a bed of creamy popcorn polenta (yes, that’s polenta made from ground popcorn) so smooth it could stand in for whipped potatoes. Meaty chunks of monkfish, often compared to lobster in sweetness and texture, gain considerable heft from the braise. 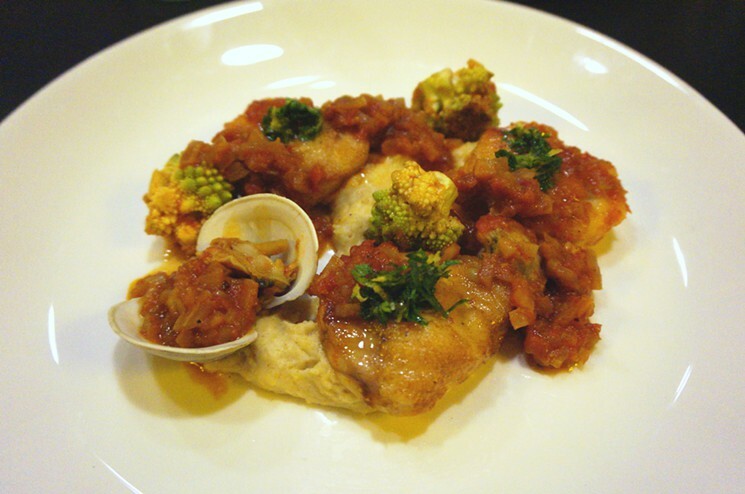 A few little neck clams add noted of briny ocean to the mild fish, all under a rustic, tomato sofrito. Tiny heads of romanesco, fractal cousins of cauliflower with spirals of pointed florets and a bright green blush, add vegetable crunch with just a hint of char from the grill. Gremolata, a tight chiffonade of herbs and lemon zest, punctuates the sofrito and monkfish with brightness. Deconstructed dishes seem to have run their course as a trend; TAG’s monkfish presentation could instead be called un-constructed — a combination that conjures osso bucco but that also seems the inspiration of a stroll through the marketplace, picking ingredients for their freshness and availability first and then building the recipe only afterward. It’s a homey and satisfying plate that seems perfectly at ease in the dark and swanky restaurant quietly, waiting amid a roster of more glamorous creations.